Riser recliner chairs are becoming increasingly popular for those who have trouble getting in and out of conventional chairs, or simply want a functional chair in their living room that can aid both their comfort and health. This type of adjustable chair can be a brilliant addition to your interior design for many different reasons that are of high value. As Riser Recliner Specialists, we thought we’d explore a few of these benefits. An electric rise and recline chair is often purchased because the user requires more support when sitting. 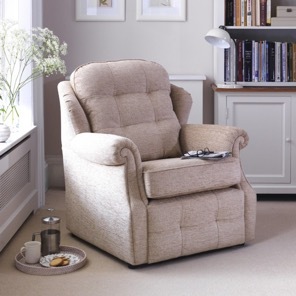 With added support when you are sitting down or standing up, a riser recliner chair can help those who struggle with a typical lounge chair and relieves the strain of getting up and sitting back down quite a lot. An electric reclining chair can offer a variety of positions depending on what you need; whether you want to put your feet up to read a book or watch TV, or if you want to fully recline to relax or even have a little sleep! Electric recliners are perfect for this as they offer maximum comfort. On top of this, rise and recline chairs are, more often than not, made out of soft fabrics or comfortable leather and have a supportive, cushioned seat and headrest. As well as being incredibly comfortable, these chairs provide a number of benefits for your health and wellbeing. People who may have trouble with back pain or encounter swollen legs would benefit greatly from an electric recliner chair. The seat of riser recliner chairs can distribute your weight evenly to alleviate any potential pressure on muscles or joints and can even help your posture. If you are likely to be seated for some time, the ability to move position in the chair can also facilitate healthy blood circulation. Once you have decided to purchase a riser recliner chair, you will find there is a huge range of choice. If you are choosing to spend the money on this type of product, you will want to ensure it matches the original design of your house and fits in well with the designated room. Often available in a variety of sizes, with the option of a single or dual motor, electric recliner chairs also have the choice of 5 reclining and rising actions. Most models will allow for a choice of fabric and colours, letting you put your own personal touch on your purchase. Whatever your reason for buying an electric riser recliner chair, you can bet it will be worth every penny as you start to see the benefits it can have! Take a look at our range of electric rise and recline chairs here.